Theatre Under the Stars is presenting both The Drowsy Chaperone and Mary Poppins this summer and, without a doubt, this is one of the best TUTS seasons yet. Both shows are excellent – the scripts, the acting, the sets, the music, the choreography, the directing, the costumes, the lighting, etc., etc. Both shows will take you to another world, escaping the real one for a few hours. The season opened with Mary Poppins on July 11. I saw it a couple of days later and, while there were still some sound issues to be sorted out with individual actors’ microphones, the performance was spot on. Led by Victor Hunter as Bert the chimney sweep (artist, lamplighter and an assortment of other jobs) and Ranae Miller as the magical, stern-yet-loving nanny with great posture who puts all other nannies (and caregivers) to shame, the TUTS production is in more than capable hands. Both of these performers are fantastic actors and singers, and the rest of the cast matches their talent and energy. Lola Marshall, 11, and Nolen Dubuc, 9, deserve a shout-out for their portrayals of Jane and Michael Banks, the two unruly children Mary Poppins ostensibly comes to help. But Mary arrives at their house on Cherry Tree Lane as much for their parents – their mother, a former actress who is having trouble adapting to life in high society, and their father, a banker whose work consumes him, neither of whom has time for their kids. As The Drowsy Chaperone’s Man in Chair notes – he’s a wealth of pithy and astute observations – “Everything always works out in musicals,” and Mary Poppins is no exception. However, a lot of effort goes into making everything work out onstage and the TUTS team really added their own unique touch to both musicals. For Mary Poppins, the Cherry Tree Lane house that Brian Ball built is like a huge Fisher Price toy that opens and closes to reveal the kids and Mary’s bedrooms on one side and the kitchen and dining room on the other, plus various hidden compartments. The other sets – that take the audience to the park and its statues that come alive, to a kitchen in which a broken table and shelves can fix themselves, and to the rooftops of London – invite the audience into Mary’s world. The starry nights and Mary’s flights elicit awe, not to mention the flying kites. The choreography is also inspired, with the problem of how to have dancing penguins join Bert in “Jolly Holiday” smartly solved, with the crowd-pleasing flag-less semaphore in “Supercalifragilisticexpialidocious” that reaches a feverish pitch and the raucous rooftop tap-dancing in “Step in Time.” It was sometimes a wonder how music director and conductor Wendy Bross Stuart kept the cast and orchestra in sync, but she did. While the energy slowed a bit as the musical neared its end – the child behind me wondered, with about two songs remaining, “How long is this musical?” – for the most part, director Shel Piercy has done a masterful job of pacing. He takes the audience on an emotional journey, with many laughs but also many touching moments. No one will be unmoved by Cecilia Smith’s performance (as Bird Woman) of “Feed the Birds” – the lessons of compassion and seeing beyond appearances that Mary teaches the Banks children are lessons we cannot learn often enough. Joining Bross Stuart in this production are fellow Jewish community members Kat Palmer, as part of the talented and enthusiastic ensemble, and Andrea Minden in the orchestra. In The Drowsy Chaperone, community member Stefan Winfield plays Broadway producer Feldzieg, while his and wife (choreographer) Shelley Stewart Hunt’s 5-year-old son Wesley plays a couple of adorable, if superfluous, parts near the musical’s end in an over-the-top number that pokes fun at the extravagant finales of many musicals, not just Man in Chair’s favourite, The Drowsy Chaperone. And, with that, Man in Chair puts the record he has just unsleeved onto the player and, as the static sounds, he introduces us not only to his beloved musical but its actors and the era. Throughout the show, which he imagines (and that we can see) taking place in his apartment, he gives a running commentary, sharing a little about his life, factoids about the actors in the play and explanatory notes about certain scenes. He both extols the virtues of the musicals of the 1920s and exposes their weaknesses, including some poor writing – the aforementioned spit-take scene and monkey motif, as examples – and some not-so-subtle racism. An example of the latter is the incomparable first scene of Act 2 – Oriental Palace, Day – which the TUTS cast performs superbly. As with Mary Poppins, there isn’t a weak link in The Drowsy Chaperone. The entire cast – leads and ensemble – bring everything they have to the stage, and it shows. Ball’s set design once again amazes, as people pop in and out of almost anywhere, and Stewart Hunt’s dance numbers use every inch of the apartment’s kitchen and living room space. Music director and conductor Kevin Michael Cripps does double duty as the Chaperone’s bartender and director Gillian Barber delivers a fast-paced, larger-than-life contemporary musical that would even please Man in Chair. Chris Sinosich was the costume designer for both The Drowsy Chaperone – which seems to have countless costume changes – and Mary Poppins. She is to be commended for the period dress in both, evoking the late-1920s and silliness of the former and the Edwardian period of the latter; as well as the stark contrasts, with Man in Chair obviously of a different era than his favourite musical and Mary Poppins’ colour-rich realm standing out from the darker, more sombre tones of the bankers’ reality. While the Chaperone may stumble along, martini glass in hand, there is no stumbling in either TUTS production this year. See both if you can. 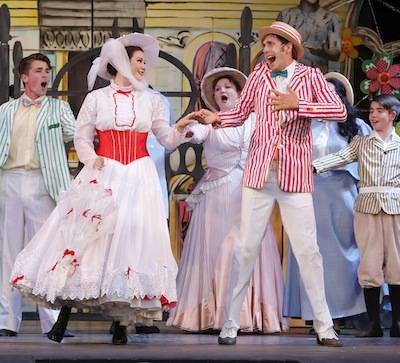 They alternate nights, with Mary Poppins closing Aug. 18 and The Drowsy Chaperone Aug. 19. For tickets and more information, visit tuts.ca.